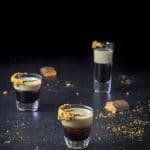 This Butterfinger shot recipe is delicious and easy to create. 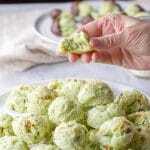 There are three ingredients, but if you’re layering, you only have to pay attention to one of them. 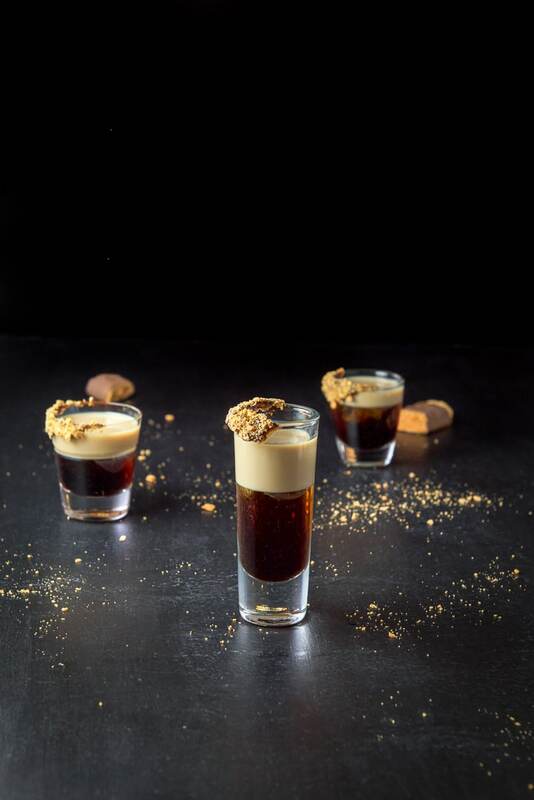 Does this Butterfinger shot taste like a Butterfinger candy bar? No. At least it doesn’t to me. Maybe it would to you. I think the reason is because there aren’t any (or many) peanut butter flavored liqueurs out there. So replicating the flavor of the candy bar doesn’t seem possible. 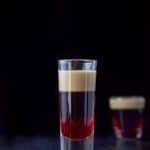 One of the shots that tastes the most like the candy it’s named for is the chocolate covered cherry shot. 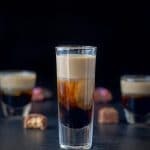 But even though it doesn’t taste like a Butterfinger candy bar (to me), this is still a delicious shot that’s well worth making!! 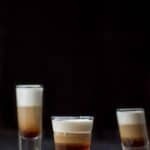 This shot is usually poured mixed, not layered, but you know me. I love layering shots! 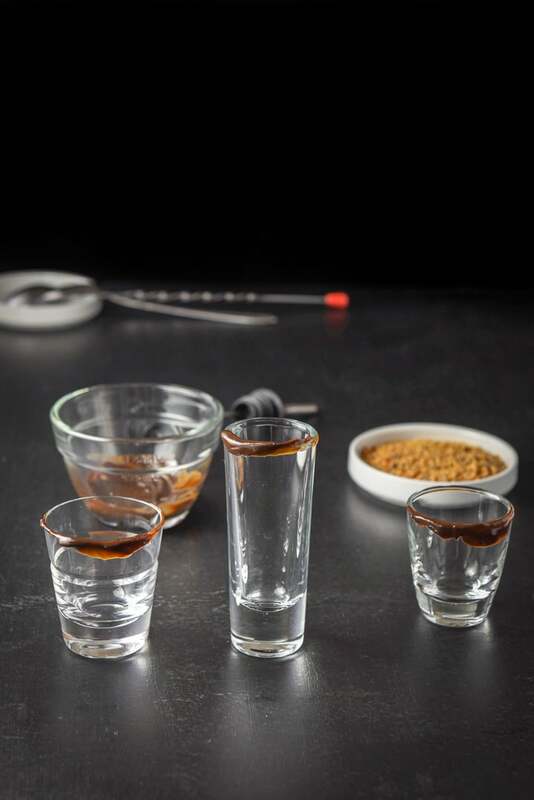 This recipe is for one shot, so multiply the ingredients by how many shots you are serving. Get your shot glass, cocktail spoon and pourers. 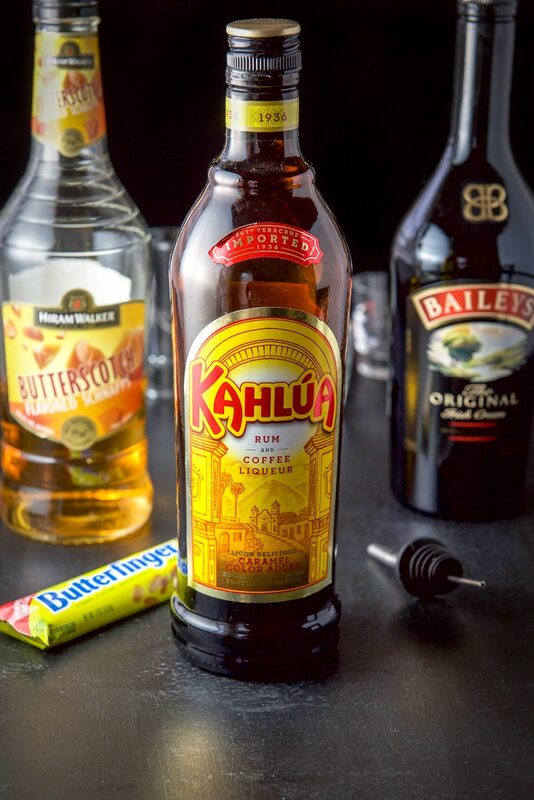 Gather the ingredients – Kahlúa, butterscotch schnapps, Baileys Irish cream, chocolate sauce and Butterfinger candy bar. Put a few teaspoons of chocolate sauce in a small bowl and heat it up. Dip and coat half of the rim of a shot glass in the chocolate sauce. Unwrap the candy bar and place half of it in another small bowl. Use a pestle or a spoon to crush the candy bar into small pieces. Dip the chocolate covered rim in the candy bits. Pour .5 ounce of Kahlúa in the glass (1/3 of the way up). Be careful not to touch the candy-coated rim. 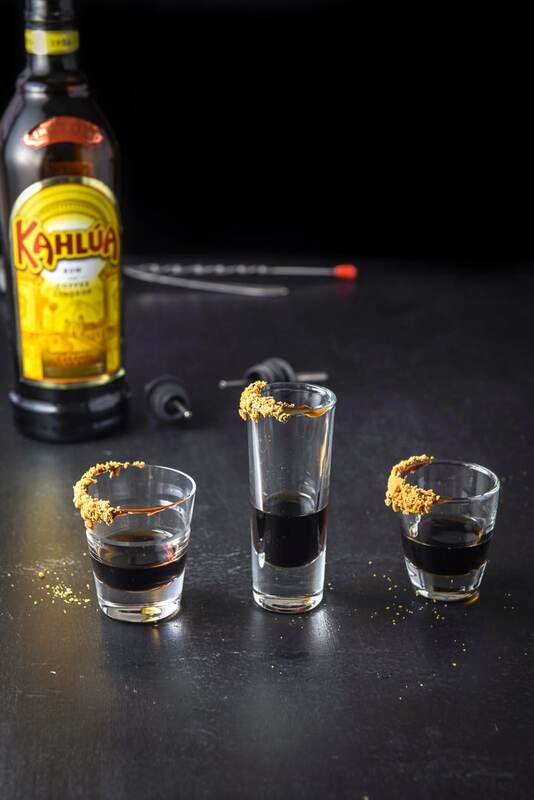 Since butterscotch schnapps doesn’t layer well over the Kahlúa, you can practice your layering or you can just pour it in. I practiced because as they say, practice makes perfect. It’s faint, but you can sort of see the layer. 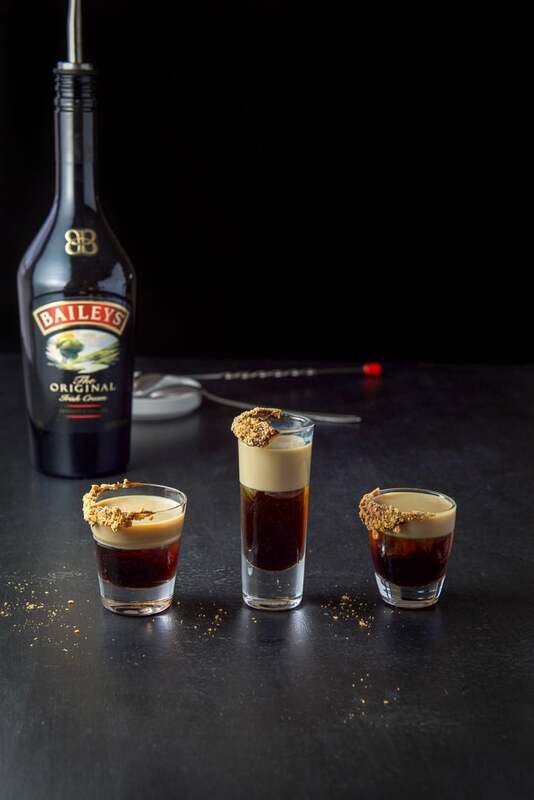 Let’s see the Butterfinger shot without the Baileys bottle in the background. Let’s see the vertical view of the shot. 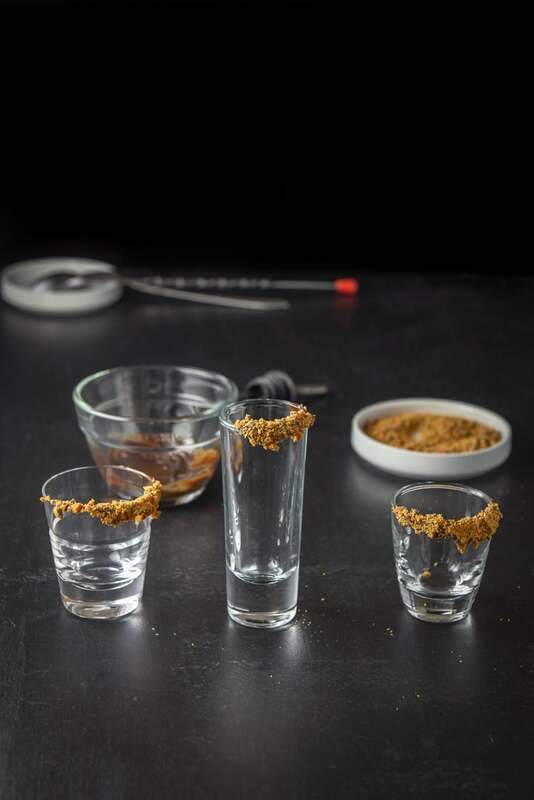 I hope you enjoyed this Butterfinger shot recipe. It is quite delicious. 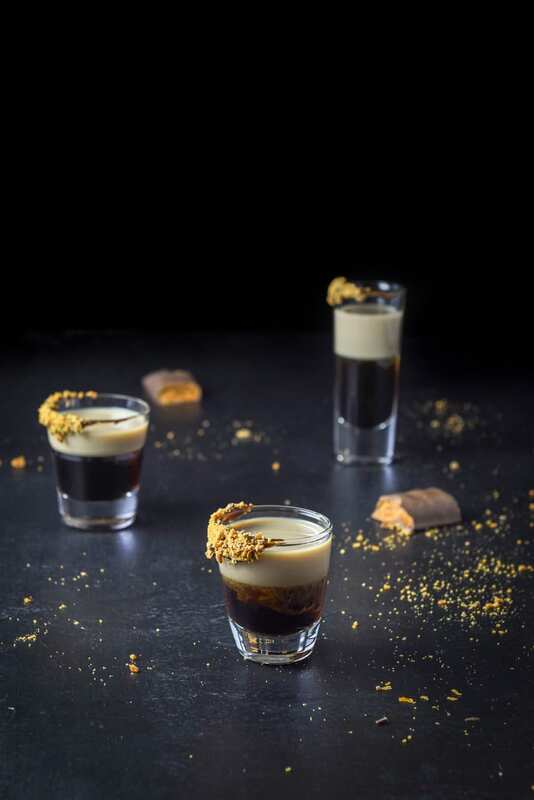 If you’ve tried this Butterfingers Shot recipe, I’d love the know what you thought about it in the comments below. I love hearing from you! You can also FOLLOW ME on FACEBOOK, TWITTER, INSTAGRAM and PINTEREST to see more of my delicious food and delightful cocktails! 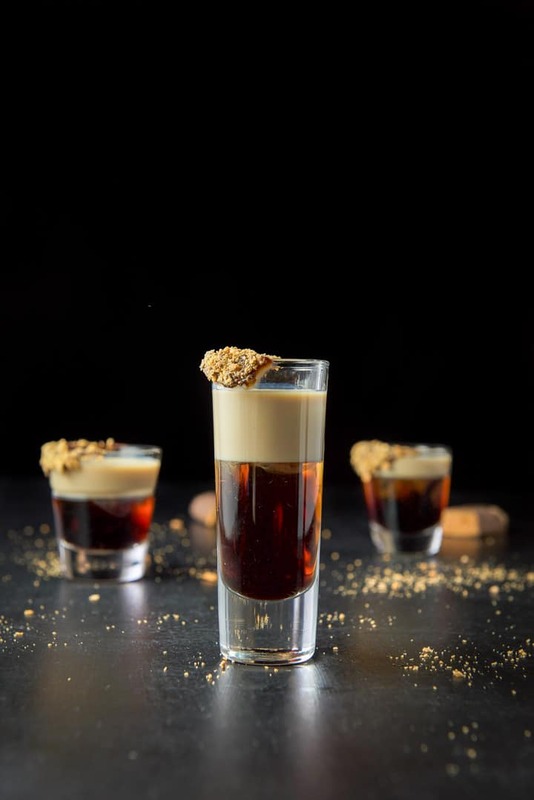 Reminiscent of the famous candy bar, this shot is fun and delicious! I’ve never been a fan of shots, but this is one I could get behind! Butterfingers are my favorite store bought candy! It’s one of my favorite candy bars too! Thanks Beth! How fun and cool is this lovely shot idea. 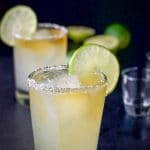 As always you have the best cocktails on the internet. I must try this weekend! Awww. Thanks Adriana! I appreciate it. I hope you enjoy it when you make it. This is the kind of shot that would get me in trouble LOL Looks so yummy! Indeed, Tisha! 🙂 Thank you! 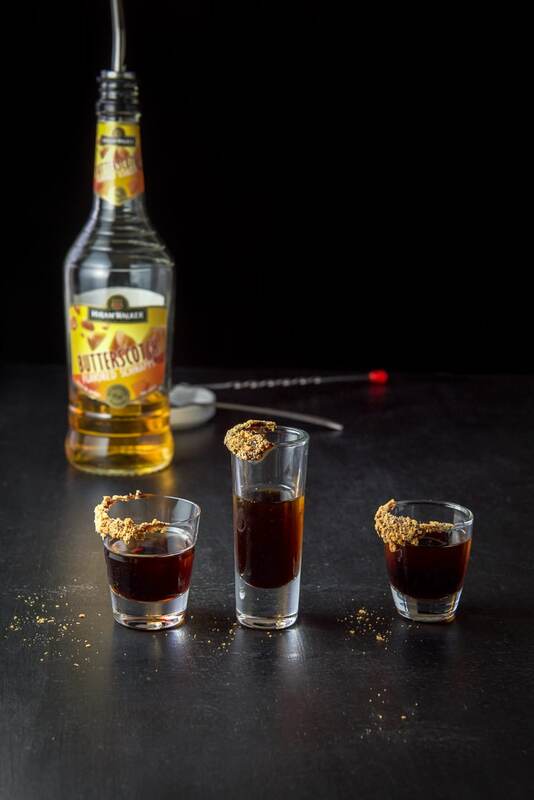 Mmm, what a delicious idea for a shot! I know my friends and I would definitely enjoy this! Aww. Thanks so much Alexandra! I appreciate it! This sounds lovely! It’s been a very long time since I’ve had a shot – I think I should experiment with this delicious sounding one! It’s very yummy! I hope you enjoy it if you try it!